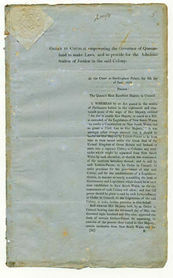 These documents are the despatch and enclosed Order-in-Council of 1859. 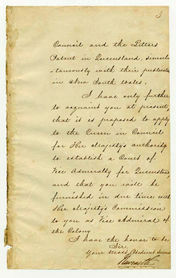 The Letters Patent of 1859 and this Order-in-Council are Queensland's primary founding documents. Both were issued by the Privy Council in London on 6 June 1859, the day now celebrated each year as Queensland Day. The Order-in-Council is the legal instrument for the establishment of a legislature in the new Colony. The Order-in-Council provided for a Parliament comprising a Legislative Council and a Legislative Assembly, and a full government and legal apparatus that mirrored the system already in place in New South Wales. 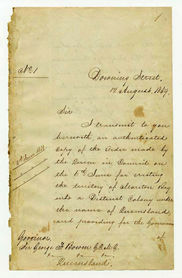 This document provided for the Proclamation of the Legislative Assembly on 20 December 1859 and is the authority for all enactments of the Queensland Parliament, including the Constitution Act 1867. The separation of Queensland from New South Wales was the subject of agitation by people who had taken up residence in Brisbane, the coastal ports, the inland pastoral areas, and agricultural areas such as the fertile Darling Downs – and by investors in these lands. The new Colony was vast; comprising 22.5 per cent of Australia – roughly the same area as the British Isles and Western Europe. The Indigenous population, originally well over 120 000, began to decline with the spread of introduced diseases, and the violence with which land was taken from the traditional occupants. By 1859, the European population numbered 28 000, overwhelmingly of British origin. Of this total, 6000 people lived in Brisbane. When Governor Bowen arrived in Brisbane on Saturday 10 December, he was driven straight to the temporary Government House in Adelaide Street, where two documents were read to the assembled crowd. These were the Letters Patent (called the Queen's Commission in reports) and Bowen's statement proclaiming that he had been sworn in as Governor by Justice Lutwyche. 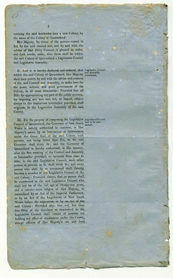 The Letters Patent was published in the first Queensland Government Gazette on that day. On the same day, 10 December 1859, Bowen appointed Sir Charles Nicholson as President of a temporary Executive Council, Robert Herbert as Colonial Secretary and Ratcliffe Pring as Attorney-General. 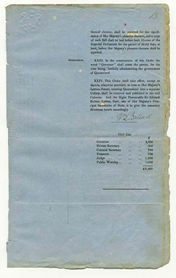 On 25 December, Robert Ramsay Mackenzie was gazetted as Colonial Treasurer. 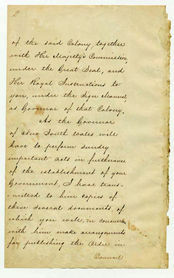 The Order-in-Council of 6 June 1859 was proclaimed on 24 December 1859, enabling the establishment of the first Queensland Parliament. 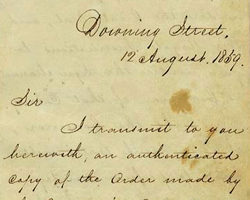 Detail of the handwritten cover letter attached to this 1859 document. Long Title: Order-in-Council empowering the Governor of Queensland to make Laws, and to provide for the Administration of Justice in the said Colony. Features: Printed document with blind embossed seal and signed by Lord Bathurst, and original despatch from Secretary of State for the Colonies, the Duke of Newcastle.